LOCK RING GUARD SIZER CREATES A CUSTOM FIT IN YELLOW GOLD RINGS. This lock ring guard/sizer creates a custom fit on most ring styles, especially on large or heavy rings. 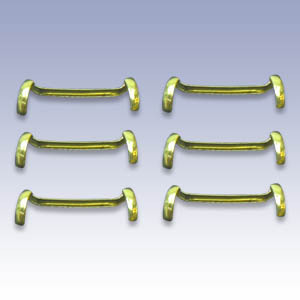 Made of 14/60 rolled gold plate material, this flash-plated ring guard features a far thicker gold layer than is found on electroplated findings. This ring guard ring sizer fits shanks 2mm to 3mm wide.